At RISC-V Summit 2018, Western Digital was a headline sponsor. 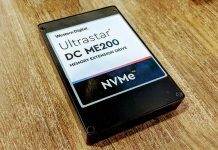 This makes a lot of sense since Western Digital needs cores in a number of its products. 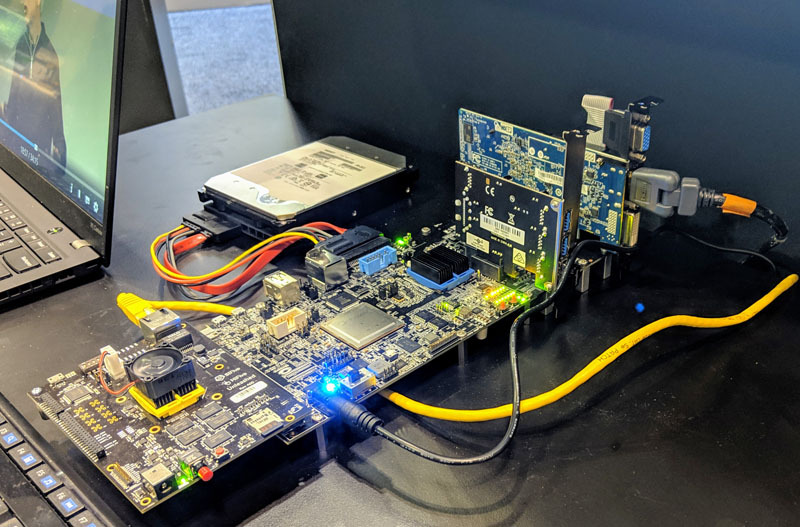 At the 2018 RISC-V Summit in Santa Clara, the company had a handful of demos. 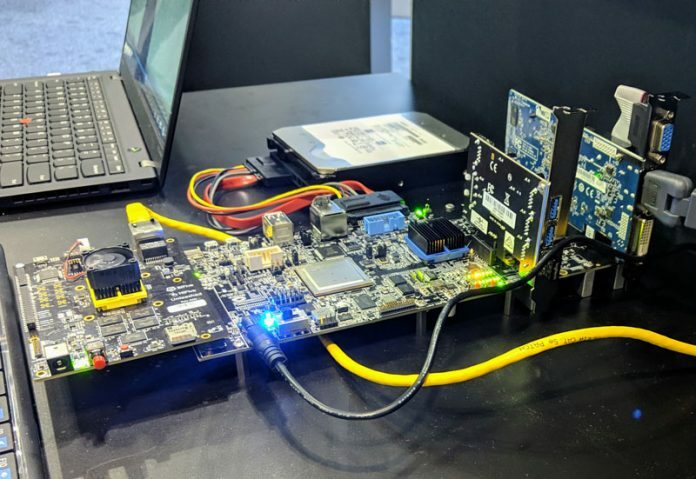 We wanted to show off the NAS powered by many of the RISC-V Summit’s largest supporters since it shows where the RISC-V project may be moving. On display, Western Digital had a full monty barebones NAS solution on display. Let us be clear, this is a completely impractical commercial prototype. 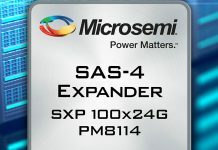 The solution utilized a Microsemi PolarFire SoC development board that costs around $2000 as a bridge. This Microsemi PolarFire board has a PolarFire FPGA and a 24 lane PCIe switch. It also has a M.2, SATA, eMMC and SD card slot. The controller board is a SiFive HiFive Unleashed development board which has a SiFive Freedom U540 SoC and even 8GB of ECC DDR4, a GbE port, and other features for a development solution. If you want to try RISC-V, the SiFive HiFive Unleashed is $1000 itself. That is more expensive than the Arm development boards, but that is the cost of entry if you want to be an early adopter of RISC-V. 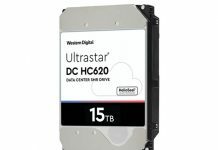 Connected to $3000 of development boards and a few PCIe cards, is a 14TB Western Digital hard drive. Ten to fifteen years ago, an 8GB ECC memory NAS with 14TB attached would have been considered a fairly good size solution. Now, it is a show floor prototype. The entire setup is running Fedora Linux and was streaming video to a laptop nearby. Aside from the 14TB NAS, Western Digital also had on display a demo of a multi-socket RISC-V solution. The RISC-V cores were implemented on Xilinx Ultrascale FPGAs and connected via an Ethernet-based coherency protocol. Each RISC-V CPU could access the PCIe devices over the Ethernet link. This is an early prototype, but cool to see. Western Digital has a need for cores. It needs to add intelligence to its storage products. It needs control planes for everything from NVMe SSDs to hard drives. Its support of RISC-V makes sense. The RISC-V Summit was a small affair, but there were a lot of enthusiastic people. It is great to see WD support an emerging ecosystem like this. Although this is a development board today, tomorrow this could power hard drives or solid state drives with direct network connectivity, next-generation My Cloud NAS units, or other devices. We wanted to take a second to applaud Western Digital on putting the effort into supporting an early RISC-V ecosystem. $3K for 14TB, they’re already down to EMC pricing.